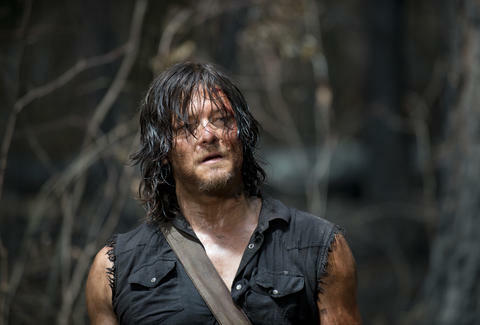 How Long Can Daryl Survive 'The Walking Dead'? This post contains major spoilers for the third episode of The Walking Dead Season 7, "The Cell." From the moment he was taken hostage by Negan and his crew, it was clear that Daryl Dixon's future was going to be rough. His removal was almost as alarming as the death-by-bat of Abraham and Glenn in The Walking Dead's seventh-season premiere. Separated from his friends and left to fend for himself at the Sanctuary, at the mercy of the world's most vicious captors, Daryl was obviously in for something bad, and over the last three weeks, all we could do is imagine what happened. Well, now we know: The longtime series fan-favorite has been enduring extreme physical and psychological torture, for what looks like weeks on end. He's been locked in a closet-sized cell without clothes or water or light. He's been beaten to the point that his body looks like rotting fruit. He's been subsisting on a diet of foul-looking dog-food sandwiches, and he's been forcibly kept awake with an ear-splitting pop soundtrack stuck on never-ending loop -- the kind of horribly sophisticated thing the Americans perfected at Abu Ghraib. This isn't just a bad time at the hands of some bad guys. It's a rigorous, complexly engineered system -- a way to break the spirit of a man who staunchly refuses to be broken. Negan doesn't want to break Daryl. He wants to hurt him. Or he's "taken a shine" to the guy, which may actually be worse. At the end of the episode, we learn that our newest big bad has big plans for one of our oldest heroes -- namely, making him one of his top lieutenants. He's promised Daryl not only an end to the unendurable abuse, but a windfall of comfort and luxury going forward, from warm beds to hot meals and all the little extras we've seen Negan's other closest advisers enjoy. All he has to do is take a knee. He has to give up his identity and swear allegiance to a monster. He has to become another Negan. But he declines. Daryl is way too strong-willed to be pressured into something he doesn't want to do, and after all the pain he's seen Negan inflict -- and Daryl's seen more than anyone -- there's no way he's going to work for the guy. He's a man who, no matter what, can't be broken. For Negan, of course, that's precisely the appeal: In Daryl he sees all the strength and conviction he's maybe lacking otherwise in his team, and he knows that he if can charm him onto his side, his empire will be all the more unstoppable. But he also knows there's a limit. Daryl's refusal to submit may be a virtue, but it's not a virtue Negan can do much with if it doesn't have a breaking point somewhere. There's no way a leader like Negan can be expected to tolerate this kind of refusal for more than a little while. He'll need to settle the question of Daryl soon, either by finding another way to persuade him or by (regretfully) killing him off. So is Daryl not long for this Earth? Unlikely: Negan seems too invested in his potential as a comrade to pull the trigger, and Dwight, his second in command, is having the kinds of doubts about his boss’ leadership that could compel him to keep Daryl safe. (Besides which, the show just axed two beloved major characters -- killing off another fan-favorite so soon would be much too brazen.) But should Negan find the urge to extinguish this wily dissident too overwhelming to ignore, we're in for some kind of confrontation, even if it doesn't prove fatal. No matter what, things can't stay this way forever.